I am an educator, tour guide, speaker and writer living in Gush Etzion, Israel. I currently teach on the faculties of Midreshet and Yeshivat Torah V’Avodah, Nishmat and Matan in Jerusalem. I am a freelance tour guide who works with groups, families and individuals, specializing in educational tours. I also work as a speaker and lecturer on various topics related to Torah study, Jewish education and Israel, and as a writer, editor and translator for various Torah publications including the Koren Talmud Bavli. I grew up in a traditional (but not Orthodox) home. We moved to New Jersey when I was four years old, and my parents had intended me to go to public school, just as they had. But I was one of only two Jews in my kindergarten class, and this was not what they wanted. So they enrolled me in a local day school and my formal Jewish education began. A few years later, we moved to Livingston, NJ – a much more Jewish area, and joined the Suburban Torah Center synagogue. Largely due to my father’s influence and with the help of Rabbi Moshe Kasinetz of the synagogue, our family slowly became fully observant. As a teenager, I became very involved in the New Jersey region of NCSY. During my senior year of high school I served as Regional President, and it was then that I realized I wanted to make a career of Jewish education. After high school I studied at Yeshivat Har Etzion and Yeshiva University, ultimately earning a B.A. in computer science, a master’s degree in Medieval Jewish History, and smicha (rabbinical ordination). Later on, when I was in my mid-forties, I took an intensive two-year course at Haifa University‘s School of Tourism, to become licensed as a professional tour guide. Shortly after we got married, my wife Monica and I spent a year in Israel as I continued my studies at Yeshivat Har Etzion. During that year, we came to two decisions: that we wanted to live in Alon Shvut (where the yeshiva is located), and that I wanted to devote my teaching career to the education of young women. At the end of that year we returned to the States and I accepted a teaching position at Bat Torah Academy, a small and quite unique high school for girls that (sadly) no longer exists. A few years later I had the privilege of being one of the founders of Michlelet Mevaseret Yerushalayim (MMY). A year later I came on Aliya and served as Director of MMY for the next sixteen years, until June, 2013. Among other things, I taught classes there on Halacha (Jewish law), Tanach (Bible), Talmud and Machshevet Yisrael (Jewish thought). 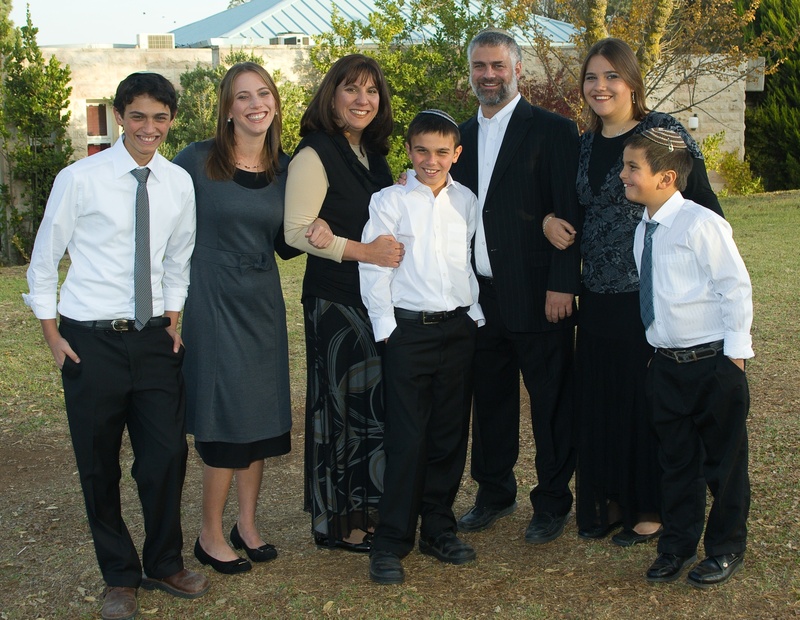 I live in Alon Shvut with my wife and my five wonderful children: Sara, Batsheva, Moshe, Tzvi and Elchanan. I consider it a unique opportunity to live in such a beautiful and historic area, as well as in this amazing community, surrounded by many great Torah scholars and individuals who are dedicated to the causes of Am Yisrael and the State of Israel.